Sometimes you just want to reaad about some everyday women with everyday problems. Well, you won’t find them here either. Remember that whole thing about “Offbeat fiction for clever readers”? I’ve tried to do normal. I can’t. I’m not sorry. The Lee and Bucky Books! 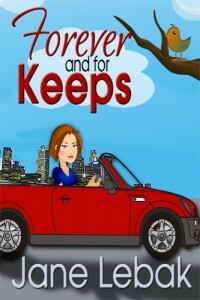 Lee’s a kid in the world’s biggest playground: she’s an auto mechanic in Brooklyn, NY, completely unattached, and can talk to her guardian angel (a wisecracker who’s hopelessly enamored with Fleetwood Mac.) 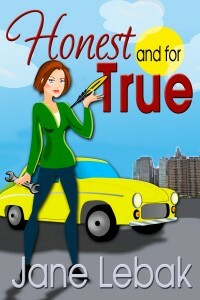 She’s got this teensie problem about lying, but only to the men she dates, and only about her job. But at some point, those lies are going to come back to sting her. Sometimes the truth sets you free. Sometimes it just makes you miserable. Peter’s a straight-laced guy who’s been helping out at his dad’s siding business, but as soon as he graduates, he’s going to enter the military. He might not save the world, but he’ll save the college money for his sister, because she’s brilliant. Afterward he’ll go to college. Until then, he can’t have a family. 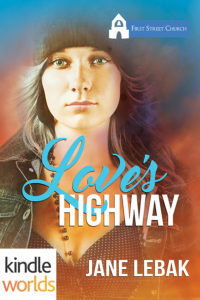 Casey’s brand new in Sweet Grove, hitchhiked in with a delivery truck and is ready to hitch back out again when she finds Peter trying to save a litter of abandoned puppies. She hops a fence and breaks into a locked shed to get them out, and now they’ve got a whole lot of little mouths to feed. Peter’s got his whole future planned out, and Casey doesn’t fit at all. But she’s also the most intriguing gal he’s ever met. And although she swears she’ll never accept help from anyone, she’s about to come face to face with a crisis she can’t solve on her own…and maybe Peter can’t help her either. Novelist and humor-writer Jane Lebak makes her first foray into Sweet Grove with this quirky novella about sacrifice, trust, and how to hop onto a moving train. One night on the news, Amber Brickman sees a woman who looks and sounds just like her. And Amber’s mother always swore she had twins, but the hospital gave her only one baby. 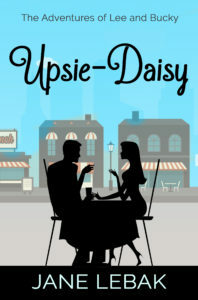 Now, armed with only ten seconds of video and the name “Katharine from Danbury, Connecticut,” Amber has to reverse-engineer the past twenty-four years to figure out exactly what happened in that delivery room. Playing viola in her string quartet is the only joy in Joey’s life. It’s certainly not her job as a tollbooth operator or her toxic family. But there’s not a lot of money in classical music, and a whole lot of competition. HARRISON: the fearless first violinist who’s always driven the group. SHREYA: the secretive second violinist who seems to have one foot out the door. JOSH: the cellist who only now is facing up to a stutter that’s kept him bound by shame. 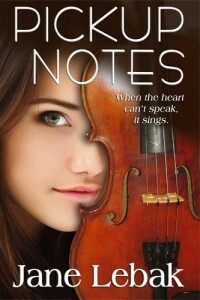 JOEY: the violist, who broke Josh’s heart and in turn had her heart broken by Harrison. When a bride gets so drunk she forgets she hired a classical string quartet, Shreya stuns everyone by ripping off a guitar riff on her violin. Seeing a goldmine in Shreya’s previously unknown skills, Harrison wants to capitalize on this by changing their entire repertoire. But changing their playlist starts twisting the friendships the quartet members have formed with one another. Harrison promised that no matter what, they’d always have their music. But as the relationships begin cracking under the strain, it’s going to take a lot more than promises and a new repertoire to save the quartet. Back to the rest of my books!